If your adult dog has been with you for a while, you can usually predict its behavior in various types of situations. But in general, you can rely on your dog's personality and temperament to stay about the same over the long haul. That's why it can be such a shock to see your easygoing companion suddenly become irritable, start snapping at people or objects, or even act downright vicious. Sudden aggression in your dog can be scary and off-putting. The key to dealing with this behavioral change is to first try to determine the cause. At the same time, it's important to keep your dog, as well as your human friends, family, other pets, and yourself, safe by seeking the help of your vet right away. In the meantime, handle the dog in a careful, nonaggressive way and take action to manage its aggression until you're able to figure out what's causing it and ideally find a safe, workable solution. Dog aggression toward people may involve a variety of behaviors such as barking, lunging, snarling, growling, snapping, nipping, and biting. Dogs can also have "leash aggression," which occurs when they're on walks and may include lunging, pulling, and barking, mostly at other dogs. It's not normal when a happy, loving dog suddenly exhibits aggressive behavior for no obvious reason. If you take a closer look, always enlisting the help of your vet, you may be able to figure out the cause of your dog's behavior change. Fear can elicit sudden behavioral and temperament changes such as aggression. 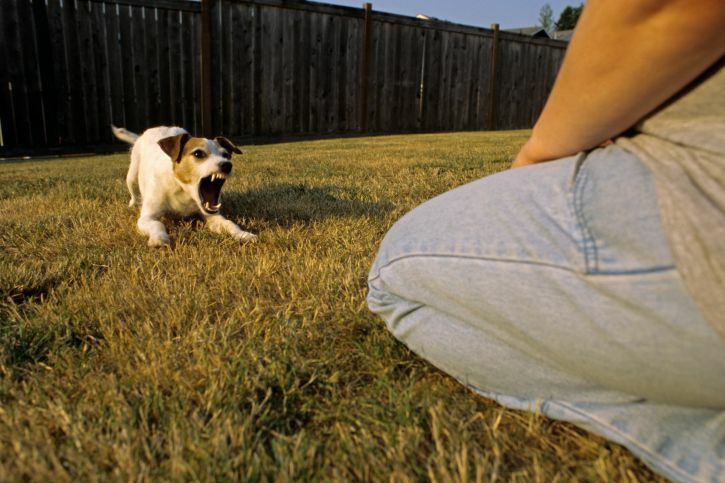 If the aggression is temporary, it might be that your dog is simply reacting to a perceived threat. However, it's still important to figure out why your dog reacted as it did if it hasn't done so in the past. You don't want to be caught off guard or put your dog in a situation that could lead to another bout of aggression. Many common health problems can also affect your dog's personality, and some can be serious. This is especially common as your dog becomes a senior and begins to develop age-related diseases. In some cases, sudden aggression in an older dog may be related to canine cognitive dysfunction or dementia. If your dog's aggression is accompanied by other symptoms, like hair loss, weight gain, or lethargy, it could be a sign of hypothyroidism. If accompanied by convulsions or rapid mood changes, it could be from seizures. Brain damage to specific areas of the brain from hydrocephalus, tumors, thyroid issues, and trauma can also result in aggression problems. An ear infection could be the culprit if your dog suddenly becomes aggressive in the presence of loud noises. If eating makes your dog grumpy, a dental issue may be the cause. An injury could be the source of your dog's sudden aggression if it seems to be in pain. To explore this possibility, start with a cursory physical exam. Look for swelling, cuts, torn paw pads, insect stings, or tender spots. Anything that looks out of the ordinary could be hurting your dog and causing the aggression. Check the inside of your dog's mouth if you feel safe doing so to see if a foreign object may be causing the aggression. It might be a daunting prospect if the dog is feeling snappy, but the problem could be something as simple as a piece of food, toy, or stick caught in your dog's teeth. If your dog threatens you in any way, though, leave the oral exam up to your veterinarian. Take note of any and all other symptoms, such as vomiting, diarrhea, loss of appetite, and lethargy, and write this information down so you can share it with your veterinarian. Regardless of whether you're able to determine the cause of your dog's sudden aggression, it's important that you take it to the veterinarian as soon as possible. If the dog has undergone a personality change, this is serious, and you need to find out what's wrong. The vet will discuss your dog's medical and behavioral history and perform a complete physical examination. The goal is to first rule out injuries and other medical problems. Blood and urine tests may be necessary to assess your dog's cell counts and organ function. X-rays may also be needed to locate the source of the problem. If your vet is unable to find a medical issue, seek the assistance of a certified canine behaviorist. An animal behavior professional can help you work with your dog using techniques such as behavior modification, conditioning, and desensitization and can also help you decide whether the risk of living with your dog is too great and euthanasia is justified. While you're working through an aggression issue with your dog, it's best to limit exposure to strangers, other dogs, or young children. A no-visitor and no-petting rule is best. Also, don't leave your dog unattended and keep it on a leash at all times while you're on walks, in a park, or anywhere else. It's not worth risking a dog bite or potential scare from your dog while you determine where the sudden aggression is coming from.